Iconic dissected pocket map of London, England in its first edition. 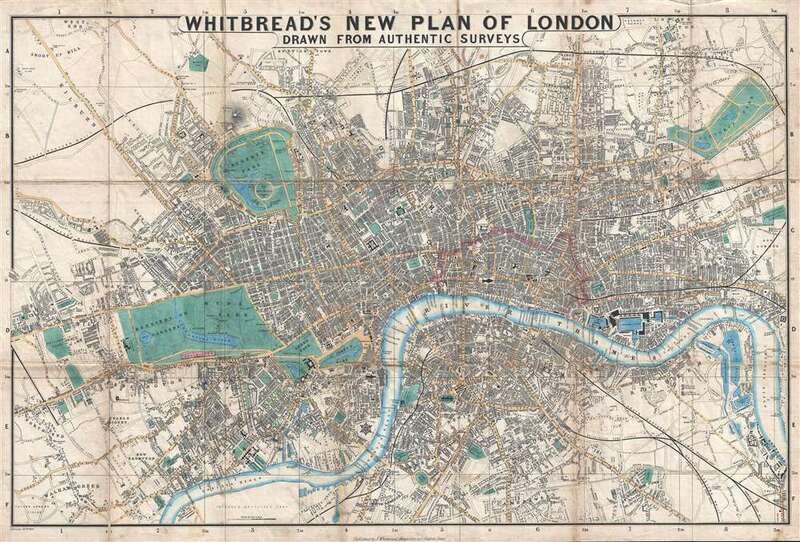 Whitbread's New Plan of London. This is the 1851 first edition, second state of Josiah Whitbread's New Plan of London. The map is dated February 26, 1851, a little over two months before the May 1st opening of London's 'Great Exhibition of the Works of Industry of All Nations,' or simply the Great Exhibition. The Great Exhibition was the first of many World's Fairs, which became important venues for trade and nationalistic advancement. The exhibition space, known as the 'Crystal Palace', is depicted in Hyde Park. The Exhibition was planned by Prince Albert, Queen Victoria's husband, and became a spectacular financial success. The surplus funds were used to found the Victoria and Albert Museum, the Science Museum, and the Natural History Museum, all of which are located in South Kensington near Hyde Park. Central London is depicted in detail from Notting Hill to Bow Common and from Islington to Peckham and Camberwell. Many iconic locations in London are identified, including Trafalgar Square, Buckingham Palace, the British Museum, Hyde Park, and the Tower of London. The Houses of Parliament and Westminster Abbey are also labeled. The River Thames dramatically cuts its way through central London and is traversed by several bridges, including Westminster Bridge, Waterloo Bridge, and London Bridge. This map was published by Josiah Whitbread in 1851 in London. Map comes with original cardboard binder and 'Index of Whitbread's New Plan of London'. Josiah Whitbread (fl. c. 1864 – 1879) was a London based map publisher active in the middle to later parts of the 19th century. Whitbread was based at 142 Oxford Street London. He published several large format maps and street guides, mostly focusing on London. When he retired his map plates were sold to Philip and Son who republished them under their own imprint. Little else is known of Whitbread's life or publishing history. Good. Backed on linen. Light soiling. Comes with original cardboard binder. Even overall toning. Hyde, Ralph, Printed Maps of Victorian London, 1851 - 1900, p. 70, no. 24.